Three classic mysteries from one of the great writers of Golden Age detective fiction, where crimes and deceptions both ancient and modern come under investigation. 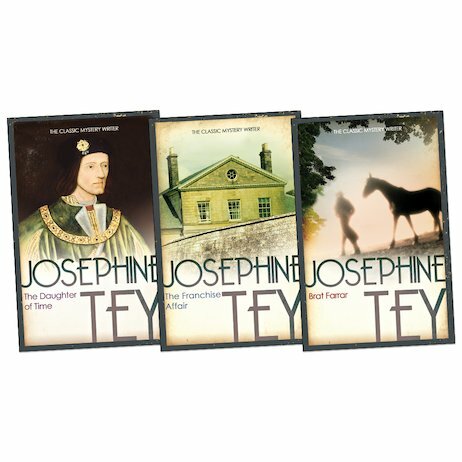 Celebrated as one of the best whodunnit writers of the 20th century, Josephine Tey helped to shape the entire genre of crime fiction as we know it today. This pack introduces you to three of her finest novels, which fuse masterful plots and psychological tension with fascinating character portraits. Will the ruthless imposter trying to steal the Ashby family fortune get away with his wicked crime? What is the truth behind a sensational story of kidnap and abuse at a country house? And can Inspector Alan Grant solve a gripping puzzle from the Tudor age, and find out whether Richard Plantagenet really killed his brother’s children to secure his crown?